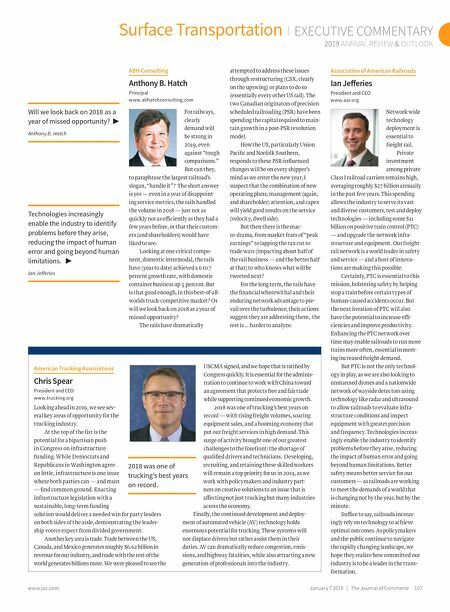 Surface Transportation | EXECUTIVE COMMENTARY 2019 ANNUAL REVIEW & OUTLOOK Januar y 7 2019 | The Journal of Commerce 107 www.joc.com ABH Consulting Anthony B. Hatch Principal www.abhatchconsulting.com For railways, clearly demand will be strong in 2019, even against "tough comparisons." But can they, to paraphrase the largest railroad's slogan, "handle it"? The short answer is yes — even in a year of disappoint - ing service metrics, the rails handled the volume in 2018 — just not as quickly nor as efficiently as they had a few years before, or that their custom - ers (and shareholders) would have liked to see. 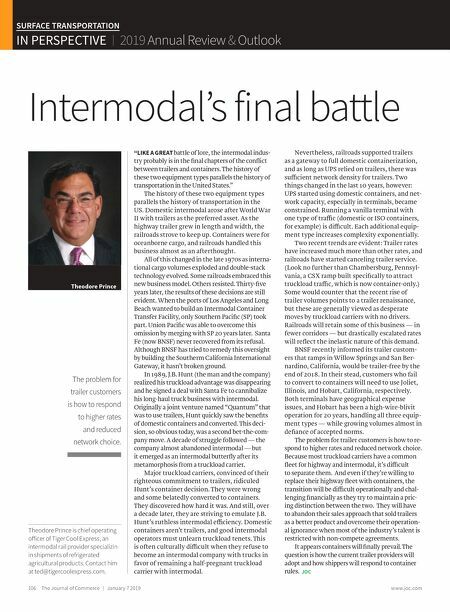 Looking at one critical compo- nent, domestic intermodal, the rails have (year to date) achieved a 6 to 7 percent growth rate, with domestic container business up 5 percent. But is that good enough, in this best-of-all- worlds truck-competitive market? Or will we look back on 2018 as a year of missed opportunity? The rails have dramatically attempted to address these issues through restructuring (CSX, clearly on the upswing) or plans to do so (essentially every other US rail). The two Canadian originators of precision scheduled railroading (PSR) have been spending the capital required to main - tain growth in a post-PSR revolution model. How the US, particularly Union Pacific and Norfolk Southern, responds to these PSR-influenced changes will be on every shipper's mind as we enter the new year; I suspect that the combination of new operating plans, management (again, and shareholder) attention, and capex will yield good results on the service (velocity, dwell side). But then there is the mac - ro-drama, from market fears of "peak earnings" to lapping the tax cut to trade wars (impacting about half of the rail business — and the better half at that) to who knows what will be tweeted next? For the long term, the rails have the financial wherewithal and their enduring network advantage to pre - vail over the turbulence; their actions suggest they are addressing them, the rest is … harder to analyze. Association of American Railroads Ian Jefferies President and CEO www.aar.org Network-wide technology deployment is essential to freight rail. Private investment among private Class I railroad carriers remains high, averaging roughly $27 billion annually in the past five years. This spending allows the industry to serve its vast and diverse customers, test and deploy technologies — including some $11 billion on positive train control (PTC) — and upgrade the network infra - structure and equipment. Our freight rail network is a world leader in safety and service — and a host of innova- tions are making this possible. Certainly, PTC is essential to this mission, bolstering safety by helping stop a train before certain types of human-caused accidents occur. But the next iteration of PTC will also have the potential to increase effi - ciencies and improve productivity. Enhancing the PTC network over time may enable railroads to run more trains more often, essential in meet- ing increased freight demand. But PTC is not the only technol- ogy in play, as we are also looking to unmanned drones and a nationwide network of wayside detectors using technology like radar and ultrasound to allow railroads to evaluate infra- structure conditions and inspect equipment with greater precision and frequency. Technologies increas- ingly enable the industry to identify problems before they arise, reducing the impact of human error and going beyond human limitations. Better safety means better service for our customers — as railroads are working to meet the demands of a world that is changing not by the year, but by the minute. Suffice to say, railroads increas - ingly rely on technology to achieve optimal outcomes. As policymakers and the public continue to navigate the rapidly changing landscape, we hope they realize how committed our industry is to be a leader in the trans- formation. American Trucking Associations Chris Spear President and CEO www.trucking.org Looking ahead in 2019, we see sev- eral key areas of opportunity for the trucking industry. At the top of the list is the potential for a bipartisan push in Congress on infrastructure funding. While Democrats and Republicans in Washington agree on little, infrastructure is one issue where both parties can — and must — find common ground. Enacting infrastructure legislation with a sustainable, long-term funding solution would deliver a needed win for party leaders on both sides of the aisle, demonstrating the leader - ship voters expect from divided government. Another key area is trade. Trade between the US, Canada, and Mexico generates roughly $6.62 billion in revenue for our industry, and trade with the rest of the world generates billions more. We were pleased to see the USCMA signed, and we hope that is ratified by Congress quickly. It is essential for the adminis- tration to continue to work with China toward an agreement that protects free and fair trade while supporting continued economic growth. 2018 was one of trucking's best years on record — with rising freight volumes, soaring equipment sales, and a booming economy that put our freight services in high demand. This surge of activity brought one of our greatest challenges to the forefront: the shortage of qualified drivers and technicians. Developing, recruiting, and retaining these skilled workers will remain a top priority for us in 2019, as we work with policymakers and industry part - ners on creative solutions to an issue that is affecting not just trucking but many industries across the economy. Finally, the continued development and deploy- ment of automated vehicle (AV) technology holds enormous potential for trucking. These systems will not displace drivers but rather assist them in their duties. AV can dramatically reduce congestion, emis- sions, and highway fatalities, while also attracting a new generation of professionals into the industry. Technologies increasingly enable the industry to identify problems before they arise, reducing the impact of human error and going beyond human limitations. ▶ Ian Jefferies Will we look back on 2018 as a year of missed opportunity? ▶ Anthony B. Hatch 2018 was one of trucking's best years on record.